Fake Lake is a Dutch duo of dream-pop musician Sofie Winterson and photographer Laura Kampman, based between LA and Amsterdam. Musically Laura had just been creating ambient in her bedroom. When she started looking for someone who she could create vocal parts with, she met Sofie. Meeting each other quickly turned into collaborating together. Fake Lake is a place that meets in the middle of their Ambient and Dream Pop interests. Whitelies caught up with the duo to find out a bit more about them. Hey there Fake Lake, whats on your mind today? Laura: We just finished rehearsing for our show this Sunday, we spontaneously wrote two new songs this week that we’ll be playing too. That makes me quite nervous but also colorfully excited. Besides that I’m quite hungry now. Sofie: We started playing music together when we became roommates a couple blocks from the Echo Park Lake in Los Angeles. A friend had asked us to support her in 2 weeks time, we said yes but hadn’t even formed a band or a proper song yet. We had to quickly come up with a name. When we looked out of the window we saw the lake, which is a pretty fake lake. Laura, first time I found you you were a model. When we finally got to collaborate you were a talented photographer and today you are a brilliant musician. How do you translate your universal approach of art into music? Laura: Getting into music I had no idea what my creations were gonna sound like. After a few months of playing I realized my music sounded like they shared a world with my photographs. The same feeling of expression naturally extended itself into sounds, which was very interesting and wonderful for me to see. It made me understand my photos and myself a bit better. Sofie, did you ever think you would be doing music with a photographer? Sofie: I’ve been making music for a long time, it’s a really different experience to play together with someone who is relatively new to writing music. Laura only had made ambient by herself in her bedroom. There are a lot of new experiences for her what gives her a really intuitive and fresh take on creating music. Which gives me a new and different take on things as well, we really supplement each other! How would you describe the work of Fake Lake? Laura: Man, I never know how to answer that question. I would say it’s minimal and vulnerable in a masculine + feminine way. It’s sofie and I combining our worlds of dream-pop and ambient. Laura: A year ago I was looking for a vocal teacher in Amsterdam, a friend recommended Sofie. I started taking lessons with her, she has studied Vocals at the conservatory. She inspired me to audition for Keys at the conservatory, I did and she played guitar on my audition. I didn’t make it but we did make it to LA for two months soon afterwards and became friends. When is the EP coming out, I’m already excited. Sofie: We don’t have the exact date yet, but probably right at the time we already want winter to be over. November. Sofie: We hope so! I was just in Berlin to collaborate with an artist living there and realized again how much I love the city. Laura’s best friend just moved to Berlin, it feels like a good idea for us to come your way. 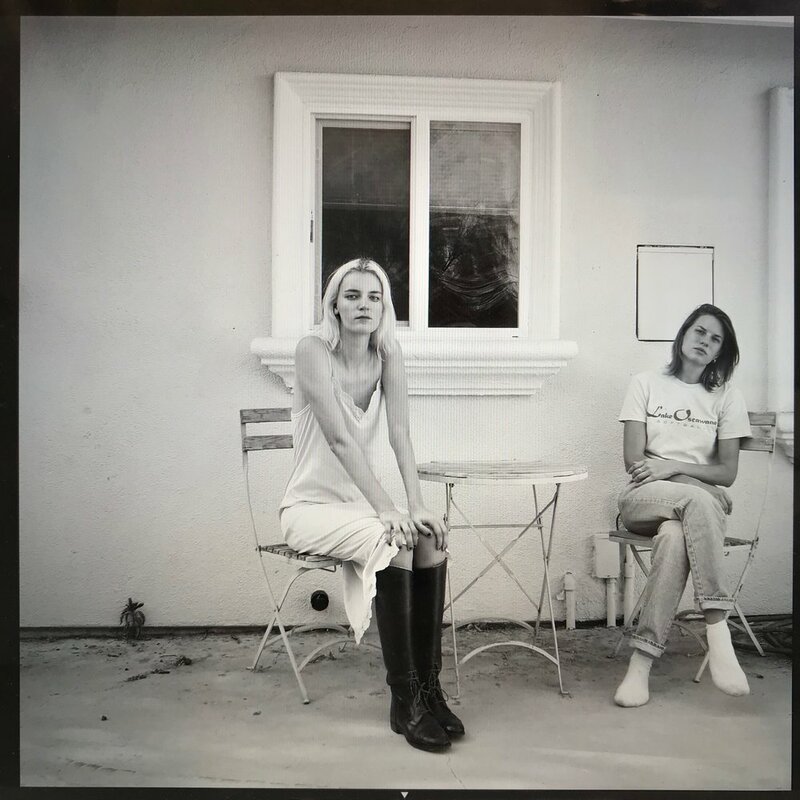 Sofie: We wrote our 1st EP in our little LA house, we were just doing it because we liked the songs ourself and it felt special writing together. There were no further plans yet. Now we have found a home for our EP. We are releasing it together with Chicago based label Fine Prints, so we already have more than we even fantasized about, it is time to start fantasizing more! Laura: I fantasize about a bathtub full of cookies on a grey beach. And to add to Sofie, meeting Ziyad from Fine Prints was a very coincidental situation. I had a layover to Chicago on my way to NY and missed my connection as my 1st flight had a 8 hour delay. I had never missed a flight in my seven years of traveling, it felt strange. Luckily I have a friend there who offered me his guest room. When I arrived I met Ziyad, he was my friend’s roommate. He liked our music and here we are. Sofie: I’m a Libra and feel like one too. Laura: Scorpio, on the cusp of Libra tho.